I think it’s hard to overstate the cognitive significance of major psychedelics for the future of sentience. But it’s also hard to convey why these agents can be valuable tools of investigation to academics who have never tried them. 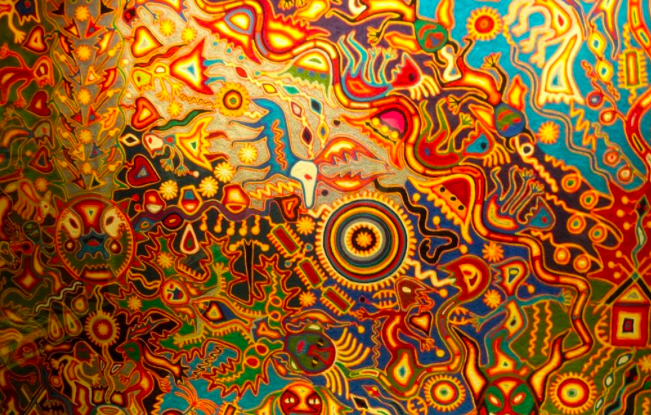 I know distinguished drug-naive philosophers of mind (and transhumanists) who are certain that psychedelia can’t be significant – and it would be irresponsible to urge them to put their assumptions to the test. Perhaps the best I can do is offer an analogy. Imagine an ultra-intelligent tribe of congenitally blind extraterrestrials. Their ignorance of vision and visual concepts is not explicitly represented in their conceptual scheme. To members of this hypothetical species, visual experiences wouldn’t be information-bearing any more than a chaotic drug-induced eruption of bat-like echolocatory experiences would be information-bearing to us. Such modes of experience have never been recruited to play a sensory or signaling function. At any rate, some time during the history of this imaginary species, one of the tribe discovers a drug that alters his neurochemistry. The drug doesn’t just distort his normal senses and sense of self. It triggers what we would call visual experiences: vivid, chaotic in texture and weirder than anything the drug-taker had ever imagined. What can the drug-intoxicated subject do to communicate his disturbing new categories of experiences to his tribe’s scientific elite? If he simply says that the experiences are “ineffable”, then the sceptics will scorn such mysticism and obscurantism. If he speaks metaphorically, and expresses himself using words from the conceptual scheme grounded in the dominant sensory modality of his species, then he’ll probably babble delirious nonsense. Perhaps he’ll start talking about messages from the gods or whatever. Critically, the drug user lacks the necessary primitive terms to communicate his experiences, let alone a theoretical understanding of what’s happening. Perhaps he can attempt to construct a rudimentary private language. Yet its terms lack public “criteria of use”, so his tribe’s quasi-Wittgensteinian philosophers will invoke the (Anti-)Private Language Argument to explain why it’s meaningless. Understandably, the knowledge elite are unimpressed by the drug-disturbed user’s claims of making a profound discovery. They can exhaustively model the behaviour of the stuff of the physical world with the equations of their scientific theories, and their formal models of mind are computationally adequate. The drug taker sounds psychotic. Yet from our perspective, we can say the alien psychonaut has indeed stumbled on a profound discovery, even though he has scarcely glimpsed its implications: the raw materials of what we would call the visual world in all its glory. Anyhow, I worry that our own predicament resembles in more extreme form the hubris of the blind super-rationalists I describe above. In fact, intellectually, I worry far more about my ignorance of other modes of conscious existence than I do my cognitive biases or deficiencies of reasoning within ordinary waking consciousness. Sure, I’d love to know the master equation of a unified field theory. I’d love even more to know what it’s like to inhabit a world of echolocation like a bat – and to understand the indescribable weirdness of LSD, DMT or Salvia. It transpires that ordinary waking and dreaming consciousness are just two among numerous wholly or partially incommensurable realms of sentience. What we call waking consciousness was doubtless a fitness-enhancing adaptation in the ancestral environment of adaptation. But it occupies only a tiny fraction of experiential state-space. Our ignorance is all the more insidious because it is not explicitly represented in our conceptual scheme. From the inside, a dreamer has little insight into the nature of a dream, even in rare moments of “lucid dreaming”; and I fear this may be true of ordinary waking consciousness too. Unfortunately, the only way to even partially apprehend the nature of radically altered states is by first-person investigation, i.e. to instantiate the neurochemical substrates of the states in question. If drug-naive, you can’t fruitfully read about them. Compare how (ostensibly) trivial is the difference in the gene expression signature of neurons mediating phenomenal colour and sound. Who knows what further categories of experience other “trivial” bimolecular variations will open up, not to speak of more radical neurochemical changes? Thousands of scholarly philosophy papers and books have been written on consciousness in recent years by drug-naive academics. Psychedelic researchers worry that too many of them evoke Aristotelean scholasticism, whereas what we need is a post-Galilean experimental science of consciousness. Perhaps the nearest I come to an intellectual hero is psychedelic chemist Alexander Shulgin, whose pioneering methodology is described in PiHKAL. Alas, Shulgin doesn’t yet occupy a prominent place in the transhumanist pantheon. It’s worth stressing that taking psychedelics is not a fast-track passport to either happiness or wisdom. If you take the kappa opioid agonist Salvinorin A found in Salvia divinorum, for instance, you might easily have a waking nightmare. And the experience may easily be unintelligible rather than illuminating. Even in a society of sighted people and a rich visually-based conceptual scheme, it takes years for a congenitally blind person who is surgically granted the gift of sight to master visual literacy. So understanding the implications of radically altered states may well take millennia. I’d hazard a guess and say comprehension will take millions of years and more. Either way, our descendants may be not just superintelligent but supersentient – blessed with the capacity to shift between a multitude of radically different modes of consciousness whose only common ingredient is the molecular signature of bliss. Posthuman mastery of reward circuitry will let them safely explore psychedelia in a way most humans beings don’t dare. Yes, it’s prudent for us to play safe; but in consequence our consciousness may be comparatively shallow and one-dimensional. Mine is today.